Our product range includes a wide range of grade copper plate. 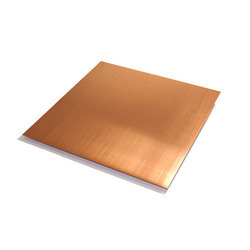 We are leading manufacturer, exporter and supplier of a wide assortment of Grade Copper Plate. The offered plate is made up of superior quality copper materials and advanced machines in compliance with set industrial norms. Offered plate is tested on various quality parameters to ensure defect free range. We offer this plate in various specifications in order to meet the vast requirements of our valuable clients.